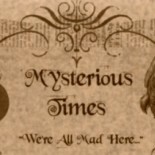 Mysterious Times | "We're All Mad Here…." The Stone Rows of Great Britain | Big, Small, Short, Tall, Have we got ’em all? Canaanean sickle blades of the southern Levant.